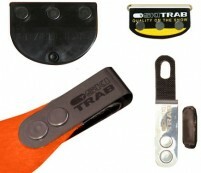 Ski Trab uses a unique Attivo fixing system to attach skins quickly and securely to its skis. Designed to be pulled with one hand from either the tip or tail, the skin fix consists of a metal clasp with a pull tab (tip) and a plastic knob (tail) that fit perfectly in custom notches on Ski Trab skis. The skins come in two flavors, mohair and mohair mix. The mohair mix skins are a 65/35 blend of mohair and nylon that match up well with Trab's wood core skis: Sintesi, Libero, Altavia, Maximo, and Super Maximo. The mohair skins are made with 100% mohair for optimum glide, and pair well with the ultralight aramid core skis: Maestro, Magico, and Mistico. Best of all, they are cut specifically for each model and length of Trab ski so you don't have to worry about finding the right size skin and trimming it to reveal just the right amount of edge. The sidecut matches one of the three main shapes of Trab skis below. Do the Freerando skins come in 100% Mohair or are the ones in stock the orange skins? Hi Kurt, those are a mohair mix. what's the difference with the silicone magico skin? Hi Tucker, it has a silicone adhesive instead of hot melt glue. They work based on pressure so have different characteristics in terms of how they stick to the ski. They tend to be easier to peel off and can be washed. They don't like frozen crystals on the ski so sometimes you need to wipe the bases before application. 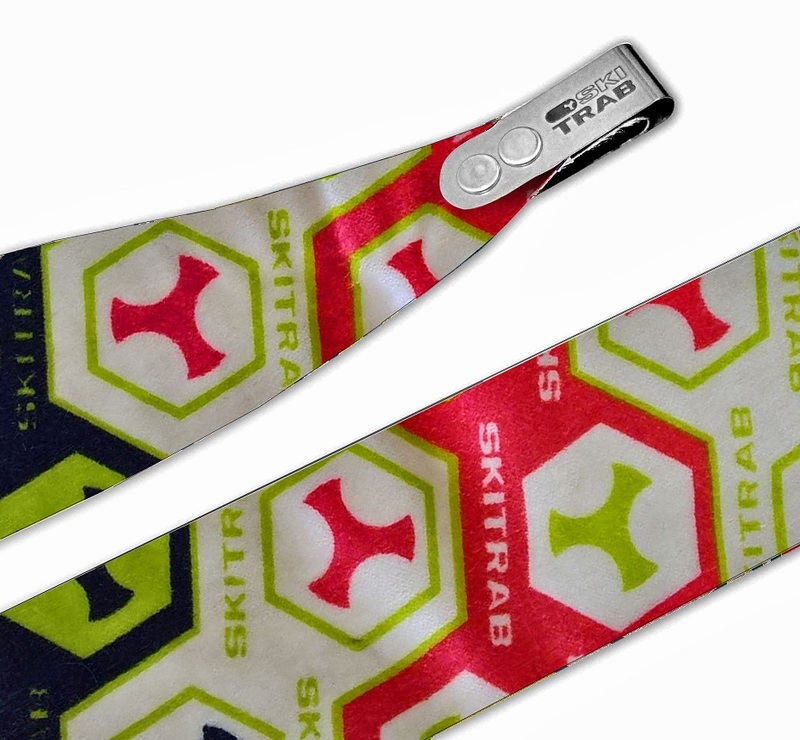 I won a pair of Ski Trab skis at a race a few years ago and I am trying to find some skins for them. I think the name of the ski is Ripido, that is what is says on the bottom. They measure 123/88/109 164cm long. Which skins should I get? Hi Anna, we can order the matching skins for you. Otherwise I'd look at grabbing some Trab skin material off the roll and add some Attivo tips and tails. My wife has had just under 20 days use on these skins and for the most part is really happy with them. The tip and tail was hard to figure out from the limited pics we could find on the internet but the tip/tail system seems to work really well, it's easy to rip the skins from either the tip (pulling the nylon tab riveted to the metal hook) or the tail by pushing the soft foam/rubber piece through the split tail. The skins glide well but don't have near the traction of black diamond nylon skins. It seems that using mohair skins somewhat necessitates a mellower skin track. The skins are starting to fray on the edges which is something I've also noticed on my Trab World Cup skins so I wouldn't say they're the most durable choice. The glue has held up better than any other European glue skin we've used (hagan, dynafit/pomoca). Overall if you buy Trab skis and want a perfectly matched skin I'd suggest picking up a pair, hopefully they last at least two seasons or retrofit the attachments to a more durable pair of skins. well that was helpful, thanks. I could not tell how these affixed. can you recommend a set of skins for Trab Volare 185 cm. Hi Nathan, we can order you some Volare skins, or you could use the Attivo tip & tail kit to assemble a skin with some material. Used these for the 3rd time out on my Magicos today, up until now they've worked great, even when doing 6 short laps and taking them on and off a lot. Today I had some pretty bad glue failures on both skins, all on the first lap. Temperatures were near 0F, and I'm wondering if that might have been part of it. Do you guys have any thoughts on how well the glue holds in cold temperatures on these skins? Is this likely user error, or should I just get some gold label? Hi Chris, glue on most skins will start to struggle when it's below zero (even gold label has limits). Be careful not to let the glue touch the snow as that will really mess things up. Also it's a good idea to store your skins near your body (e.g. inside your jacket) on the down so they can warm up. I have two pairs of Ski Trabs, Ripidos and Freerando Xls, both in 171cm. I am watching Ski Trab quickly disappear from every website in the US which is a bit disquieting. Looking at your precuts you only have the 178cm left. Not surprising. The Ripidos came with Volare skins. The Freerandos don't have a set of skins to call their own but the Volares fit them well enough. Questions: You offer three types of cut to fit Ski Trab skins. The Volares are the orange. Are you planning to continue to source these skins or when they are gone, they are gone? How would the yellow race skins compare to the orange or the mohain/nylon skins? Do you have the tip and tail fitting for these skis? Tab and cam for the Ripidos. Not sure what was OEM on the Freerandos. Am I unnecessarily concerned? Other skins will perform as good or better than Ski Trab's and I should just stockpile the Attivo parts? We love Trab skis and plan on working with them for the long haul. We can get you the precut skins for the Ripido. Send us a picture of the other ski so we can identify the model (the names can be a bit confusing). We do have the tip & tail attachments listed here. The race skins are a good deal faster and lighter, but less durable than the orange. Other skins can work OK as well, but it can be nice to have the machine precuts with the specialized tips and tails. I am looking for Ski Trab skins for my (bought at end of last season) ripido skis. Hi Jeri, I will contact you about custom ordering the skin to match your skis. Overall: Five Stars for a light and fast climbing skin with an attachment system for Trab skis that is secure and innovative yet simple and easy. Only drawback is the durability of 100% mohair for highly abrasive late-spring and summer snow (and assorted non-snow skinning surfaces). Background on product familiarity: Over 61,000’ vertical during the 2014-15 season in a variety of winter and spring conditions on the Trab Magico. I generally use 100% mohair skins on my race skis versus mohair-nylon mix skins on my various touring setups, from a variety of brands (e.g., Atomic, Black Diamond, CAMP, Colltex, Dynafit). First, the first impressions out of the box: Thin, light, supple, smooth! But more importantly, a big “ah hah!” upon understanding at long last how the metal and plastic hook flips over the ski tip. And the tail attachment is equally clever. The skin glue is relatively light. And the skin store bag is a work of beautiful (if excessive) craftsmanship. Second impressions, in use: Hard to describe how the tip attachment works … other than the overall assessment of “perfectly”! Easy to attach, super secure, easy to grasp, and easy to remove. The tail attachment is not anywhere near as strong, but then again a tail attachment is just a backup anyway to prevent the skin tail from curling away. Yet if you jam the ski tails into the snow, the skin tail might start to slide a bit up the ski base (as the skin attachment clips into the tail split). I highly doubt though that this would ever result in a skin glue failure. And speaking of skin glue failure, none to report, across temperatures ranging from arctic to room. Although given the light glue, I was careful with multiple laps in condition extremes. Removal is easy from either the tip or tail. Trab says that if you intend to remove the skin at the tip, then you should first release the tail attachment “button” but it always came off just fine for me when I had removed from the tip without bothering first with the tail release … before I had bothered to read the little user guide, whoops. That same guide has an interesting comparison chart that purports enhanced grip on the 100% mohair touring skins compared to the race skins (although reduced glide). Hard to tell whether the solid grip I experienced compared to my race setups was attributable to a different mohair type or instead the full width and length. But either way, the grip seemed about as good as typical momix on my other touring setups. Trab furthermore claims better grip for its 100% mohair touring skins than its own momix skins (available only in Europe during the 2014-15 season), although I’m skeptical. Third impressions, for long-term durability: That same little guide acknowledges decreased durability compared to momix, so not the best choice for plush durability or laminate resistance to tears/punctures if you anticipate extensive skinning on highly abrasive “snow” in late spring and summer along with travel over various non-snow surfaces. Otherwise, the elegant design of the tip and tail attachments probably enhances their durability. What is 18 + 1?